Ask an Italian if spanakopita is Italian or Greek, and you might be treated to a long anecdote about the Roman empire and why the dish is, in fact, Italian. 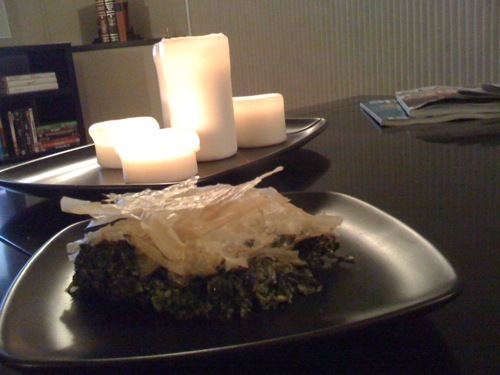 The rest of us will probably just agree that spanakopita, like its name, is Greek. Regardless, we recently made some slight modifications to an ancient family recipe, which, Greek or Italian, was pretty awesome. Cue less than stellar picture and recipe below. Heat oven to 350 degrees. Saute onion and garlic in butter just until tender. Combine all ingredients, except 1/4 cup grated Parmesan cheese and filo. Turn mixture into greased 2-quart baking dish. Sprinkle top with reserved cheese. Top with 6 sheets filo. Spread olive oil or butter between each sheet. Bake 60 minutes. Do you recommend Spanakopita? Make your voice heard!